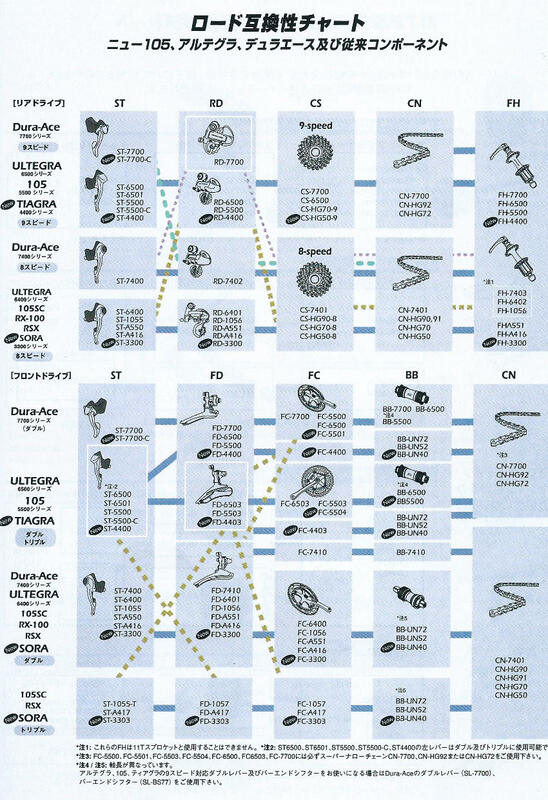 Shimano compatibility charts come in handy for assembling your bicycle, planning purchases, or troubleshooting. We have included their compatibility charts from 2000 here as well as notes to these charts. The marked Freehubs are not compatible with 11-tooth cogs. The ST shift levers ST-6500, ST-6501, ST-5500, ST-5500-C, ST-4400 are compatible with either double or triple cranksets. The spindle lengths vary on bottom brackets for double or triple cranksets. Brake compatibility charts for 2000 systems were not available.